Sambar is a favorite among the South Indians. The sambar recipe is generally a lentil based vegetable stew made with tamarind. 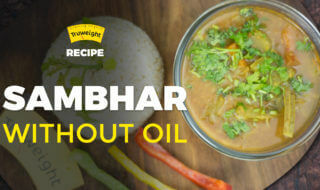 This recipe of truweight is a little different from the sambar recipe because it is cooked without oil which is healthy as well as nutritious. Try out this yummy stew recipe for a healthy you! In a pressure cooker, add the dal, carrots, snake gourd, brinjal, onion, tomato and turmeric powder. Pressure cook it. Then add coriander powder, chilli powder, jeera powder, tamarind water, asafoetida, and salt. Boil for 5 mins and serve. Think You Have Diabetes? 7 Symptoms to Watch Out For!